The small wine village of Villánykövesd (German: Gowisch) has approximately 300 inhabitants and is located 34km southeast of Pécs. It was already populated in the middle ages and once belonged to the Bóly property of Count Batthyány. At the end of the 17th century, 19 Serbian families lived in the village. They left the settlement around 1730 when German Catholics migrated to the village. The increase in viticulture in Villánykövesd can be attributed to the German colonists. The church hill is worth visiting. 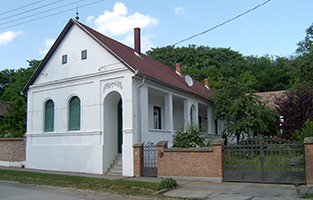 When taking a stroll towards it, one can see several farmhouses from the interwar period the original structure and facades of which have been preserved. Often, a high wall made of loam is built at the rear end of the houses’ yards. Usually, a cellar was built into these walls, which was mostly used for storing fruit and vegetables. Next to the bridge that crosses the village’s brook, a more recent memorial can be found. It commemorate the villages’ victims of both World Wars. Villánykövesd lies on the northern side of the Villány Mountains and therefore has no local viticulture. The winegrowers therefore have vineyards on the other side of the mountains where the conditions are ideal for winegrowing. Due to the families of Blum and Tiffán, local winegrowers, the village is a popular destination for wine lovers. The wine cellars are built in two rows in a rolling curve close to the country road and are listed as protected monuments. The largest cellar was built in the 1750s in baroque style by an Italian master builder and nowadays belongs to the Battyhyány family. Their subjects had to pay a duty on their wine. Today, the cellar is used as a touristic destination and also contains a restaurant. Every year, the international Wine-Song-Festival is opened here. The wine cellars are among the most beautiful tourist attractions in the whole wine region. A German farmhouse from the interwar period. 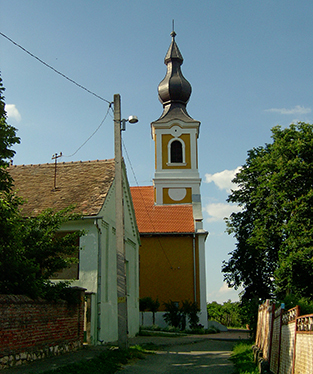 The Roman-Catholic church Assumption of Mary which was built around 1780.